Sweet Rocket is an biennial flowering plant that grows to about 60cm tall and produces upright spikes full of sweetly-scented flowers. 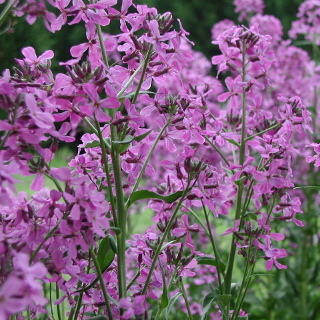 This mix contains pink, purple and white flowering varieties. Young leaves edible, similar to cress. 450 seeds per packet. Photo by Berean Hunter (CC BY-SA 3.0).